Has Ukraine's President Poroshenko Forgotten How To Speak Ukrainian? KIEV, Ukraine -- Ukraine’s President Poroshenko has been mocked for “forgetting Ukrainian” by Russian media after struggling to recall the word for “wallet” during a press conference. 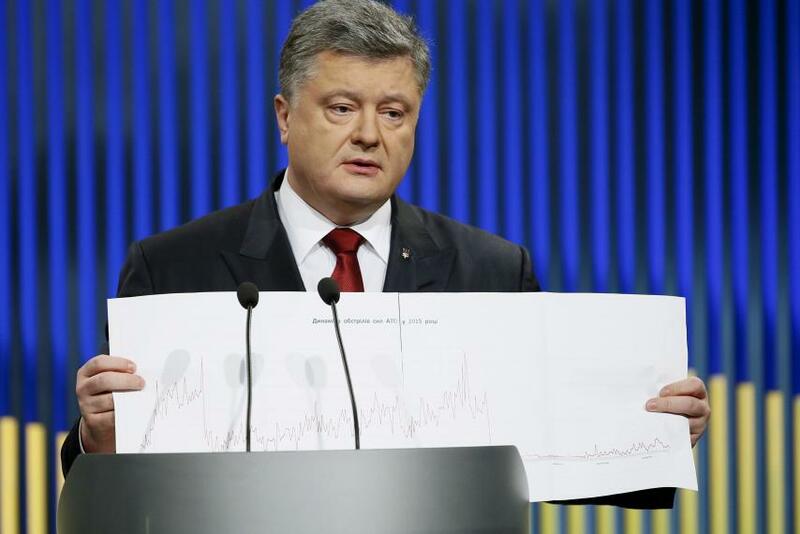 Ukrainian President Petro Poroshenko attends a news conference in Kiev, Ukraine, January 14, 2016. While Ukrainian is the only official language in Ukraine, Russian is widely spoken in some regions, most notably the war-torn Donetsk and Luhansk, parts of which have been seized by pro-Russian separatists and Crimea in the south, which was annexed by Russia in 2014. The fate of these regions was the focus of Poroshenko’s conference as he vowed to "ensure the renewal of Ukraine's sovereignty over the occupied territories of Luhansk and Donetsk" in 2016. He also claimed regaining Crimea from Russia was “a priority”. The President’s bold words, however, did not distract from his gaffe when asked about oligarchs and the status of his own private investments. While answering a question in Ukrainian about his own entrepreneurial past and his charity work, Poroshenko turned to his aide to ask what the Ukrainian for word for the Russian “koshelyok” was—meaning “wallet”. “Hamanets,” his aide chimed in and Poroshenko continued the conference in Ukrainian. The incident caught the Russian media’s attention as Poroshenko represents the pro-European side of Ukrainian politics, when the likes of his predecessor Viktor Yanukovych, was a native Russian speaker from Donetsk and was toppled for his pro-Russian policies. Immediately Russia’s government-owned newspaper Rossiyskaya Gazeta accused him of forgetting the language with the Russian army’s channel Zvezda and state news agency RIA Novosti, levelling the same accusation. Meanwhile Ukrainian news agency Unian has likened President Poroshenko’s gaffe with that of Yanukovych, who in 2013 forgot the Ukrainian word for “Christmas tree” during a public address and after an uncomfortable 10 second pause used the Russian “yolka”. Pro-Kremlin Russian daily Komsomolskaya Pravda declared the President’s gaffe as evidence for the fact that the alleged “artificial fight against the Russian language” in Ukraine. Poroshenko has backed initiatives to raise the profile of the English language in Ukraine, asking the government to change the format of passports and identification documents from having Russian and Ukrainian text to English and Ukrainian in November. However Poroshenko has also endorsed initiatives that promote the Russian language in Europe, so long as they are not tied to the agenda of the Russian government. In March he issued a statement saying an international Russian-language news TV channel “urgently” needed to be set up in Europe to service Russian speakers who currently receive their news from Russian state-run enterprises.